We really dislike some online merchants who are selling similar items - but they are made from a less expensive synthetic glass or acrylic. Those less expensive knobs fade over time and look cheap - even from across the room. These are true depression green glass. Depression Green decagon ten-sided crystal clear glass drawer knobs - perfect for kitchen cabinet or drawer knobs, furniture drawers, bathroom vanities, dressers, restoration of vintage furniture or for any style of decorative cabinet hardware. 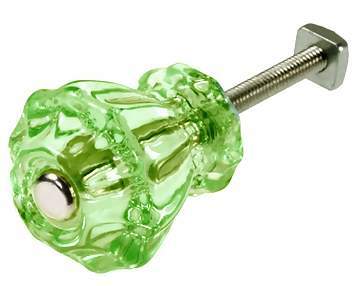 Made from the finest silica glass and were individually hand made by professional glassworkers. Measure 1 1/4 inches (32 mm) in diameter (measured from point to point on the hexagonal) and they have a projection of 1 1/4 inches (32 mm). Sold individually and come complete with the Chrome 2 1/2 inch hardware. Brass hardware available.